A rapidly expanding and creative internet retailer deserves an equally vibrant and engaging fit out. 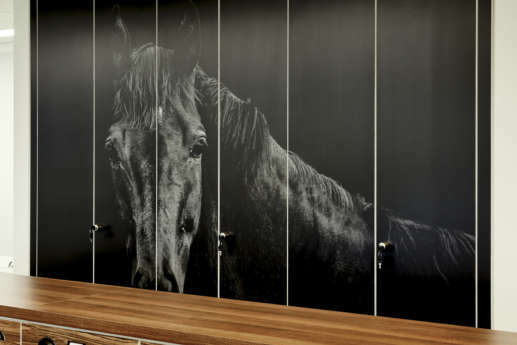 We created spaces inspired by history books, a locker room and even the latest computer tech. 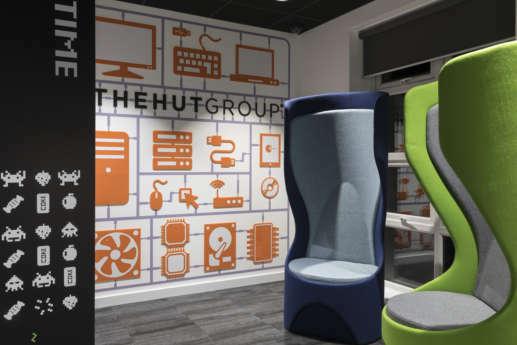 The Hut Group (THG) was going through a period of rapid growth, and despite already occupying several buildings at Gadbrook Business Park in Northwich, they needed additional offices to house their expanding teams. 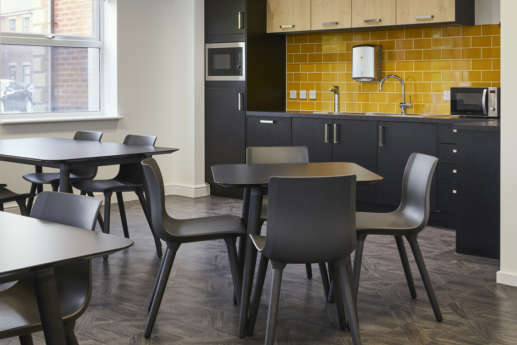 After acquiring three additional sites, they teamed up with Overbury to refurbish the spaces. 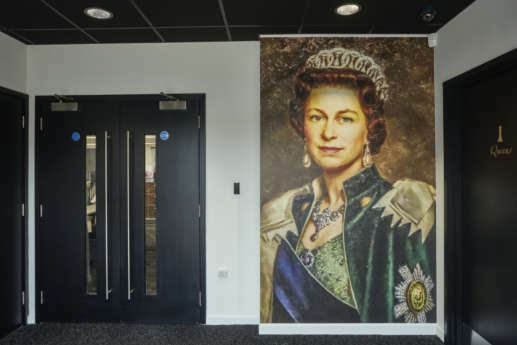 We delivered three Cat B refurbishments varying in size from 5,000 to 15,000 sq ft, each with a distinct theme and personality. The sites house their sports nutrition brand - MyProtein, group services and technology teams. By definition, internet retailers are often looking for new ways to market and disrupt traditional business. This approach is no different with THG’s three office fit outs, each with a distinctive personality that you won’t find in your average office. We worked closely with their internal design team to create an identity for each area, providing a unique home for each business unit. Our first project for THG was to refurbish a new space for MyProtein, which has successfully grown to become Europe’s number one brand for sports nutrition. So, we knew the space had to be fit to house staff that live and breathe sports and nutrition every day. The overall space was inspired by a gym and locker room, completed with a running track past the workstations. 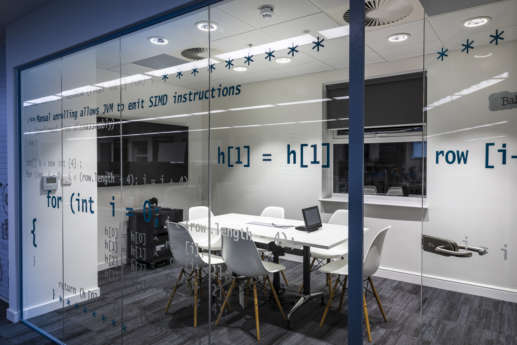 Hertford House was our second project for THG, which was designed to be a tech-inspired space for their IT team. 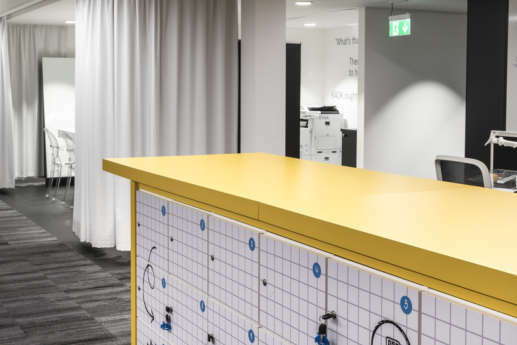 The refurbishment started with a complete strip out of all partitions, ceilings and floor finishes before undertaking a full Cat B fit out, which included mechanical and electrical equipment, new lighting schemes, wall partitions and floor finishings. 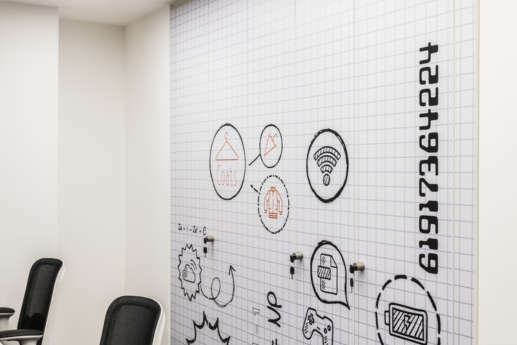 The space is a homage to all things tech; from laser cut circuitry wall panels, to space invader-style graphics and even HTML code printed onto the walls. It’s a bright, engaging and dynamic area for a team that’s responsible for the technology that underpins the business’ daily operations. 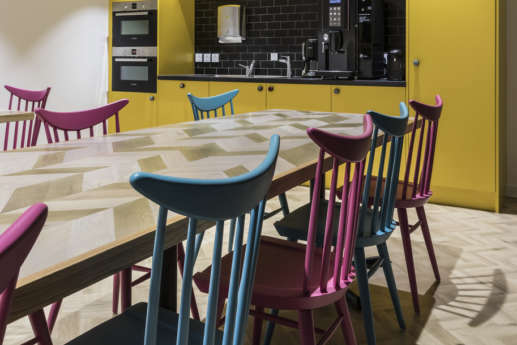 The office features a bright and vibrant colour palate; from pastel light blue, pink and yellow in the kitchen to a darker blue in the meeting room, complete with a 50” touch-screen desk. 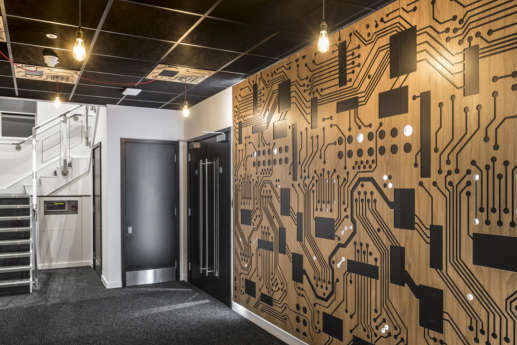 We placed wooden panelling with a circuit board pattern on the walls and ceiling in the hallways, to provide a contrasting, biophilic design feature to the otherwise tech-centric design. 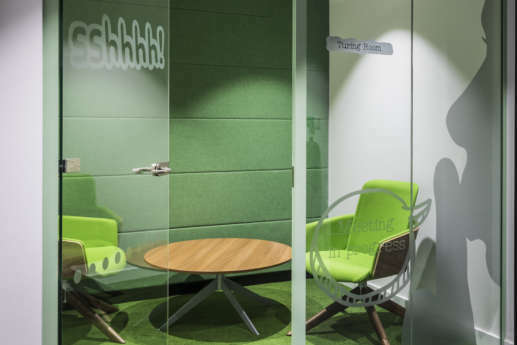 Since the office adopted an open plan layout, we selected soft furnishings and meeting pods where colleagues can quickly catch-up and hold a meeting in relative privacy. 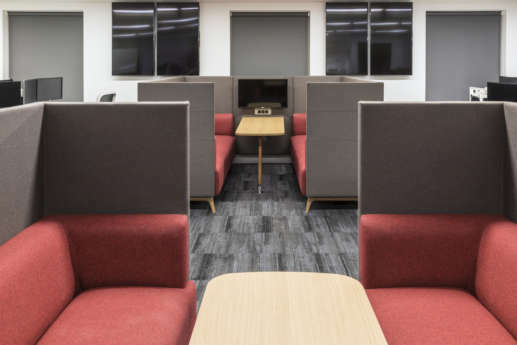 The pods are finished with soft fabrics to absorb acoustics and have integrated monitors so colleagues can quickly share their work with one another. 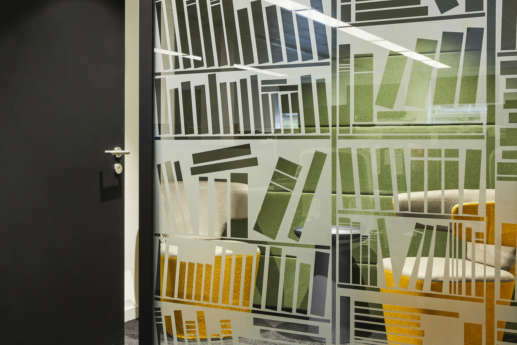 The third project at Gadbrook Park was a 5,000 sq ft fit out for the group’s shared services and finance teams. Having previously completed both fitness and IT themed fit outs, we worked with their design team to develop a fun, faux Victorian theme. We designed this fit out to feature a refined colour palate with brown, black, white and grey hues. Large prints of royals, both past and present, provide a striking entrance to the space and establish the theme of modern regal chic. 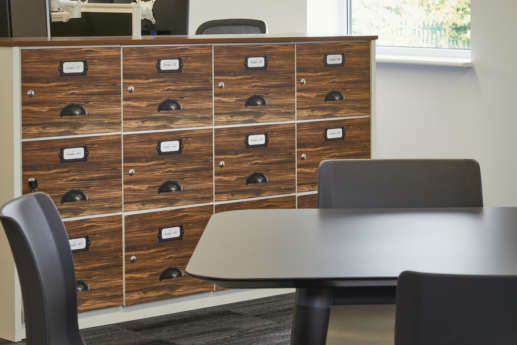 The office is divided with a mix of traditional workstations, collaboration spaces and both large and small meeting rooms. 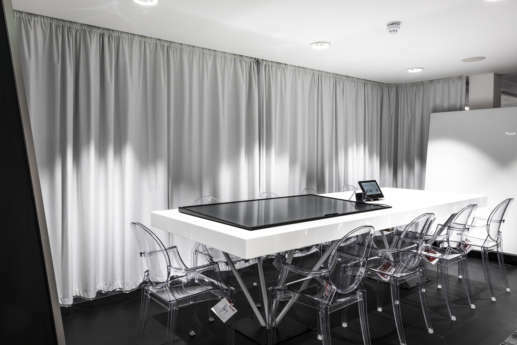 To allow light to flow naturally into the meeting rooms, we used full length glass walls with opaque film applied to add privacy, and continue the regal theme with subtle detailing. 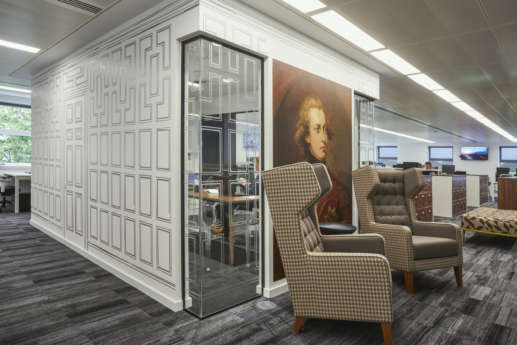 One meeting room has an effect applied to mimic library books, while the other features opaque wooden panelling. 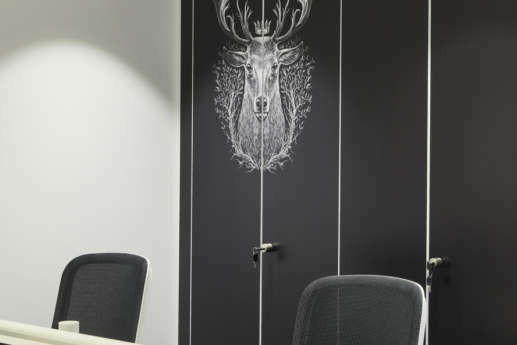 The theme is finished off with black and white animal head prints to provide a nod to the old-English homestead, including printed black and white mock wooden wall panels.